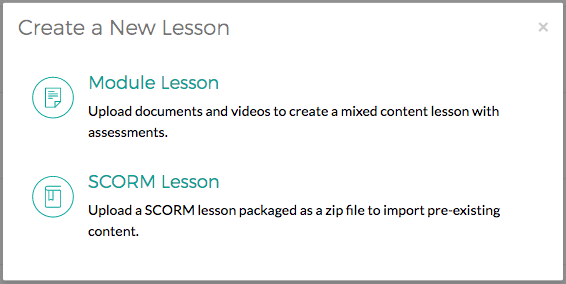 Video modules allow for the creation video lesson content without using the Velpic editor. These are perfect for video content that you have already created to upload into Velpic. You can upload your existing MP4, MOV and AVI files as video modules. Go to the lessons view and click New Lesson. 3. Select the file you wish to upload. This will be the first module in your new video lesson. 4. 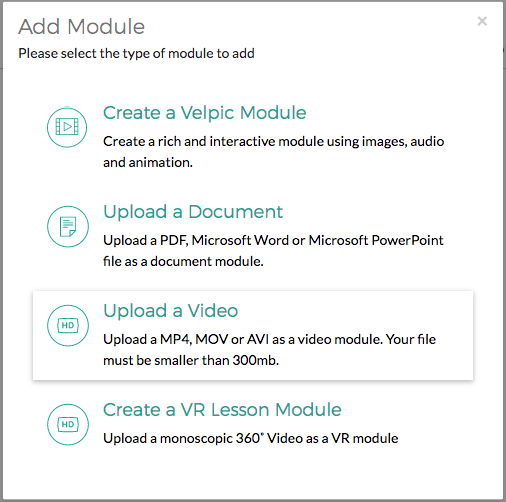 In the edit lesson screen you can choose to add additional Document or Video modules by clicking "Add Module.."
6. Modules can be reordered by dragging and dropping the module. Once you are happy with your structure click the Preview button to view the module in it's entirety. Click the publish button to make it live. Once it is published you can schedule it using a manual or automatic schedule rule, or add it to the library, just like a Velpic lesson.